They said it is a state whereby your body produces some chemical in moment of fear or excitement..
and this chemical (read:adrenaline rush) can make you do things that is beyond normal. ex: running faster than normal or being braver than ever. I do think it is important to pump up your adrenaline, because it just makes you feel ALIVE. It’s the time whereby most of the oxygen travels to your brain, and somehow you feel freshened and lively all of a sudden. 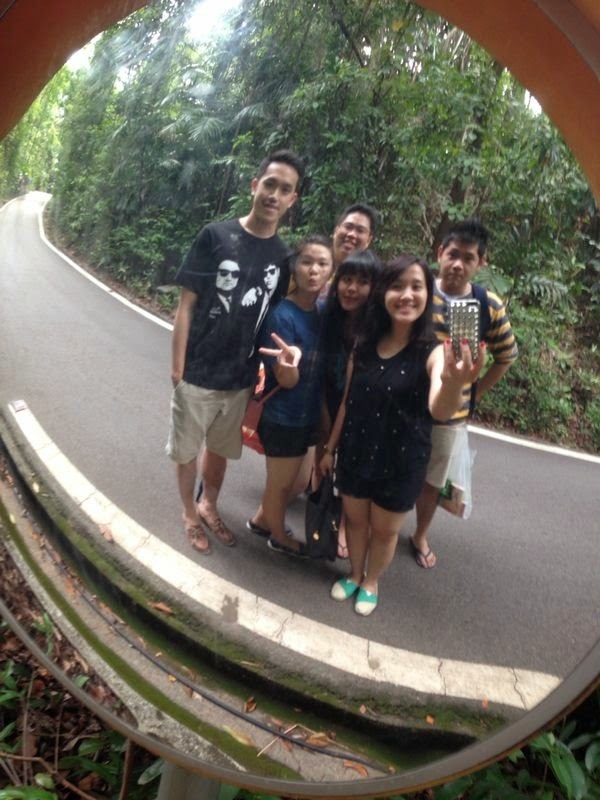 Last week.. Me, Bern and 9 of our friends went to Sentosa to raise up some adrenaline.. haha. 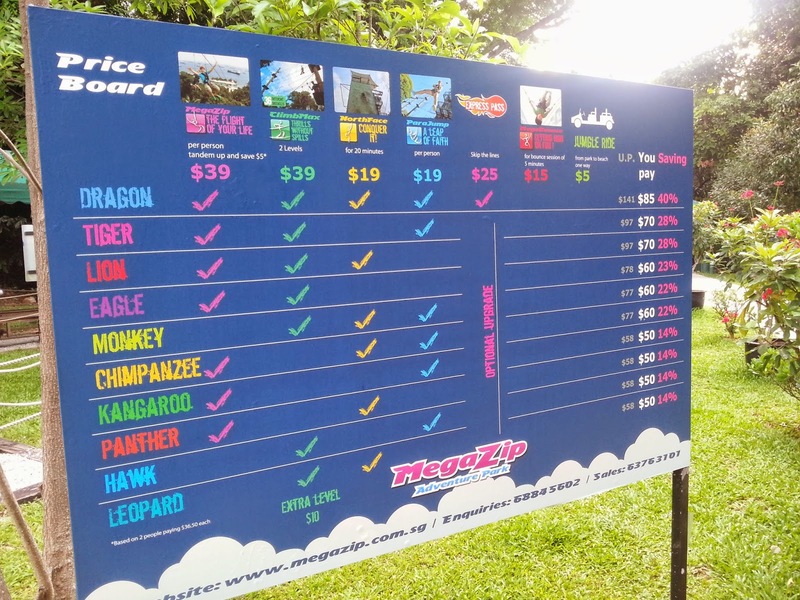 So, in the other part of Sentosa Island.. there’s something like an outbound park called Megazip Adventure Park. 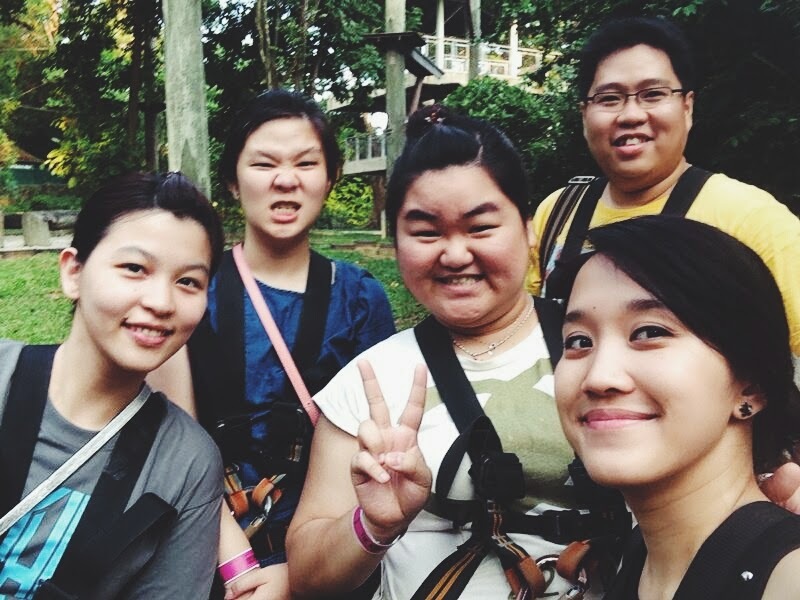 – Climbmax : it’s like a normal outbound, but i think it’s very hard.. whereby there’s huge trees, ropes, some wood-logs, and they made 24 obstacles out of it..
but you can mix and match activities if you want too. so, to make things easier.. they have made the pricing table for you. so, some of us took the Kangaroo package and some others took Chimpanzee package. we need to sit down to be briefed by their crew. you are not allowed to bring backpack or totebags.. only small sling bag allowed. and all valuables will be put aside in one bag which you can bring along with you later on. i know.. its very embarrassing for some of the girls. but it’s for safety reasons.. so, you cannot skip this out. after they weighed our weight. so, in this place, they will put the safety harness around you..
they have 2-3 types of safety harness according to your weight. 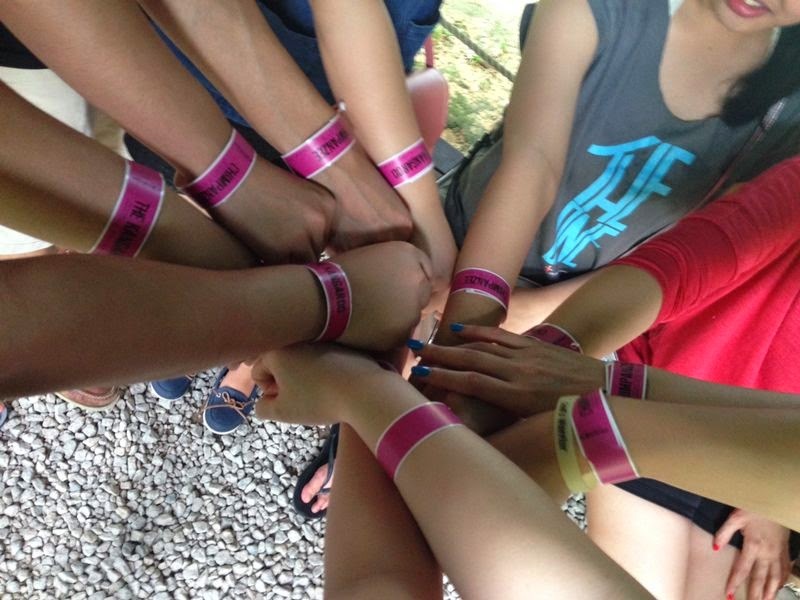 most of the girls normally will get the yellow colored ones. okayy.. now, we are ready to hit the park ! we already did ‘eenie meenie mainey moo’ aka cap-cip-cup in bahasa..
and Cindy is very first one to jump, followed by others, me in the second last, and Manda for our lucky last. 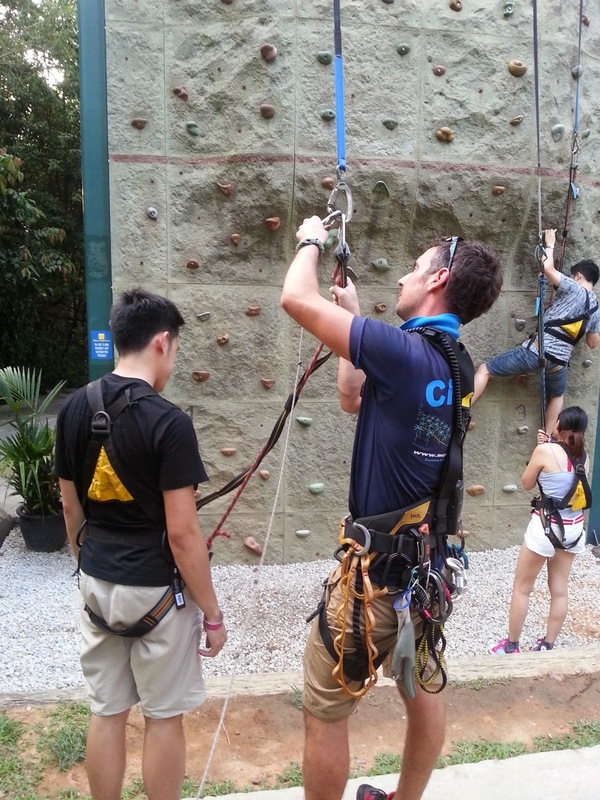 before you jump, they will ask you to turn your back and attached a ballast *pemberat* to your back. The ballast holds a bit of your gravity, so we will turn into pieces after we jumped down. if you see from below pictures, maybe it doesnt seems so high. Buttt.. Let me tell you the feeling when you are on the tip of the ledge. my heart beats faster, my hands turn cold, i cannot breath properly.. i can feel all the symptoms of the adrenaline rush. i want to show you the video that Cindy took for me. please see at my Instagram @jendluvu if you would like to see. but it really takes tons of courage to step out from the ledge. 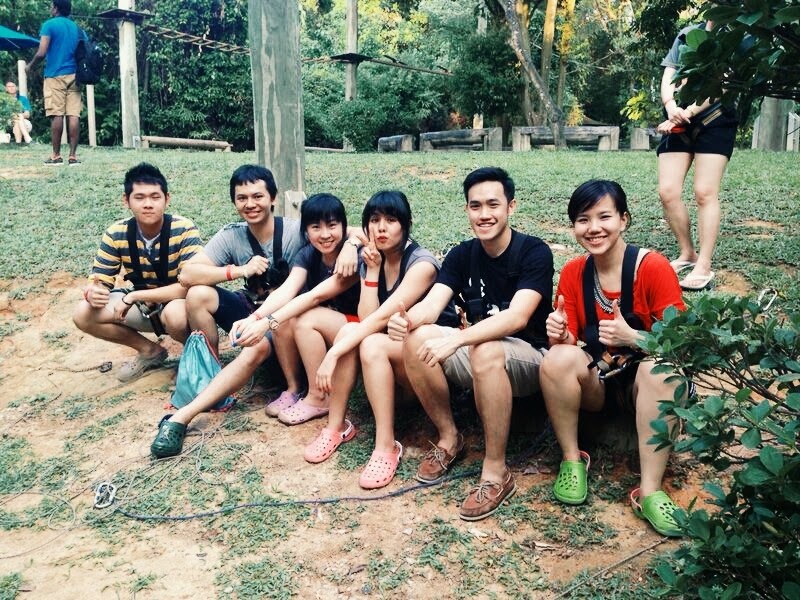 but we all made it.. hehe..
and we all agreed that the scariest part was when we step our leg out from the ledge. the rest of the process is just normal. 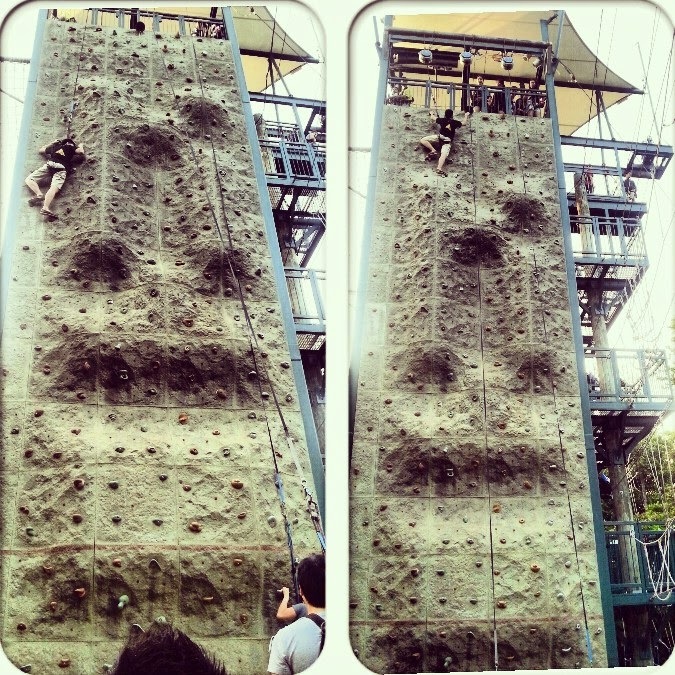 haha..
Secondly is the Northface aka Rock Climbing for the Chimpanzee team. The Chimpanzee team waited for quite awhile, because the rock climbing can only accommodate 3 players. 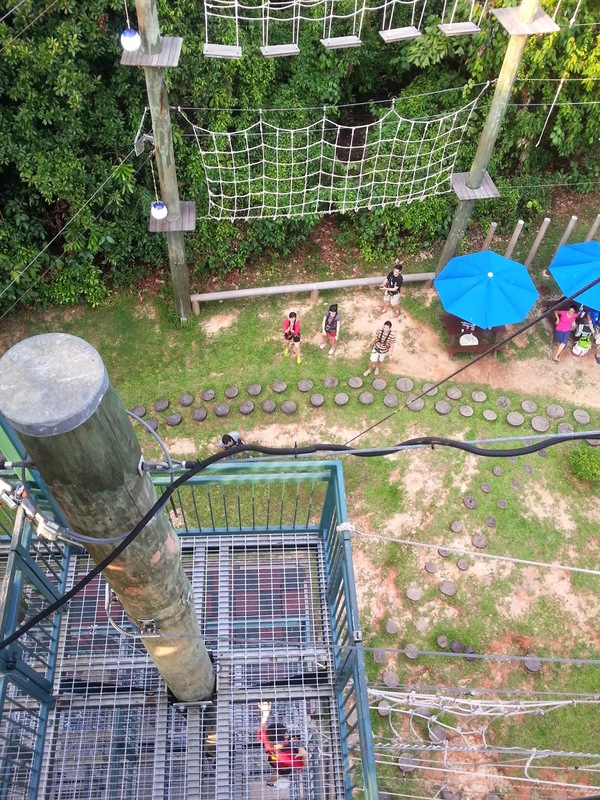 You can try to climb for 20 mins.. if you still cannot reach the top to ring the bell, then the guards will stop you and let the others to take the their turn. got this 2 taiwan couple tried to climb up for the umpteenth times.. but they cant even pass the red lines. 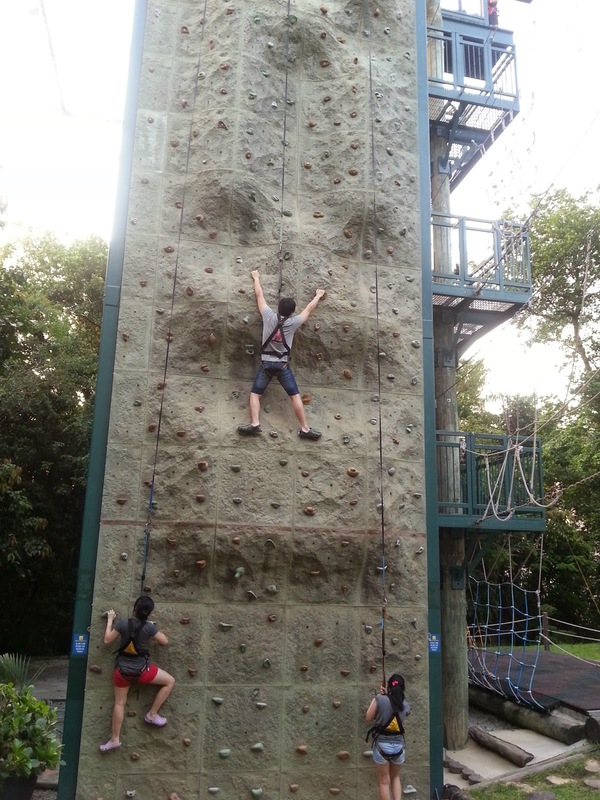 i think their hands are too tired already..
and finally, it’s Bern’s time to climb..
the guard will ask you to climb a bit and go down again, only to test ropes that will bring you down. he said he unlocked one of his life achievements. hahaha.. *sama lebay.nya* hahaha. and finally, our last game of the day.. The Megazip aka flying fox. 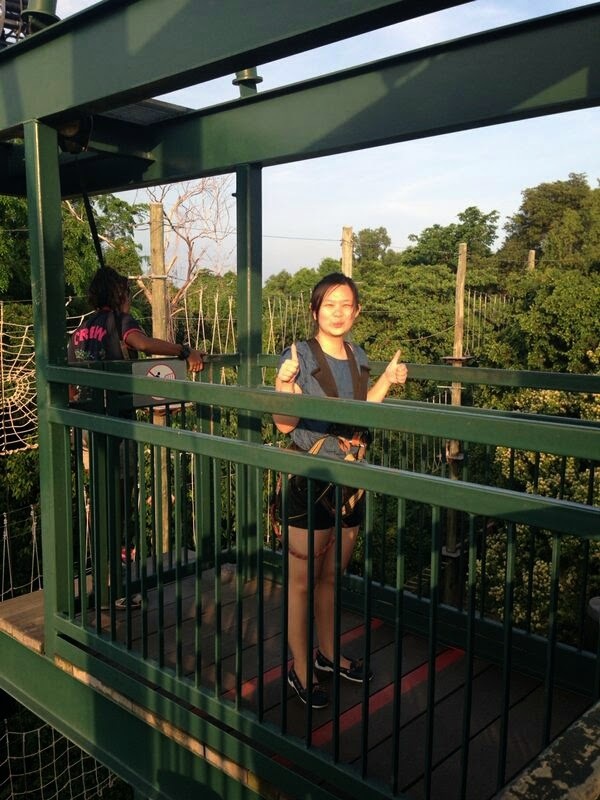 This flying fox is 450 meters long and 72 meters above the sea level. i only have below pictures for you to see..
yes.. we are sliding from one Island to another Island!! compared to Parajump, this one is scarier, because they will hang you first and nothing to seat in. after that, they will just released you all of a sudden, and your body can just turn back and front anytime. i faced the front side at first, but halfway down the road i turned around and facing the canopy jungle. 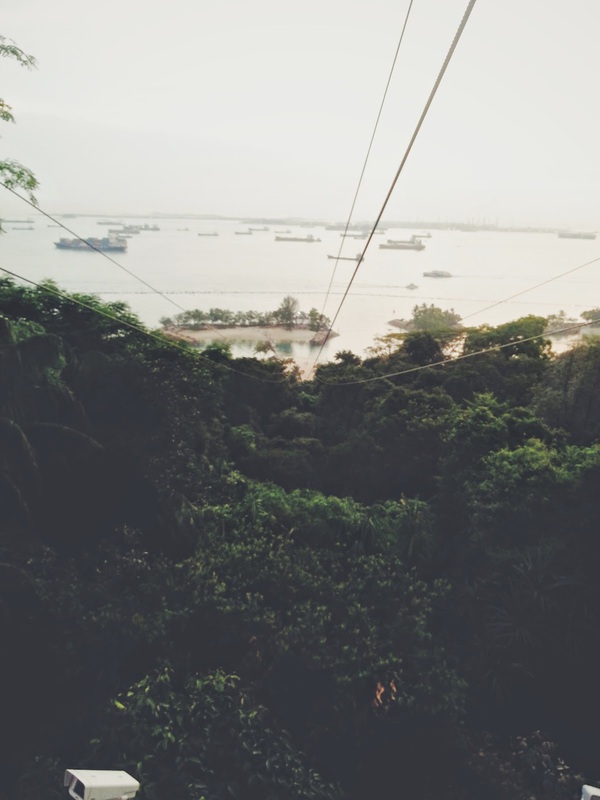 but i love this ride the most.. because you can feel the adrenaline rush longer and whiz and breeze over the canopy jungle and siloso beach. oh ya.. you can do tandem as well if you like.. or if you are a little bit afraid to go alone..
but i think they have maximum weight to go..
another funny thing also happened here..
2 of my friends (lets say C &amp;D).. they went tandem for this rides, because one of them afraid to go alone. then suddenly.. they stucked at the middle! hahaha..
they are fine.. no injuries.. no faulties.. we assume they are just a little bit too heavy. haha. so the guard came along and pull them to the other side of the island. 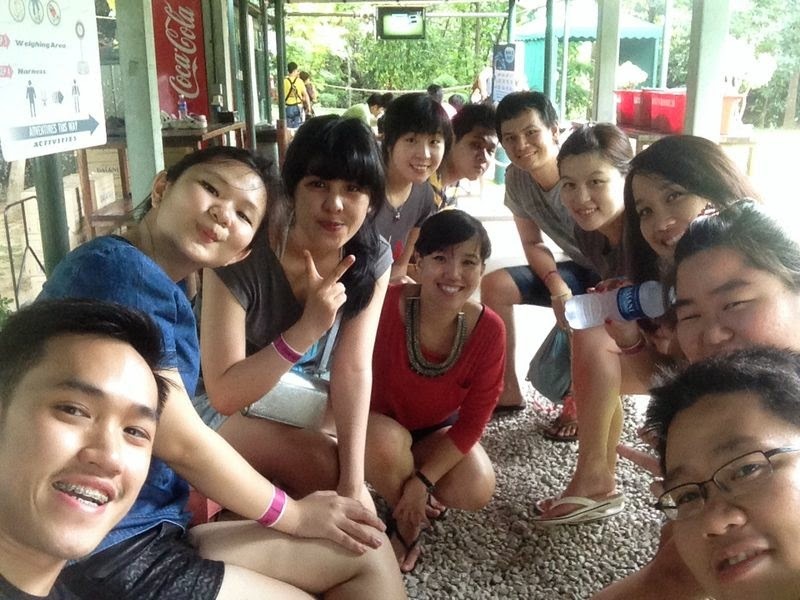 so, my suggestion is.. just go solo and enjoy the ride yourself.. haha..
overall it was a very very great experience. I recommend you to go at least once in your lifetime, and just feel the adrenaline rush that travels within your body..
this makes me wants to go for skydive or bungee jump..
but i dont know if my heart can take it or not. 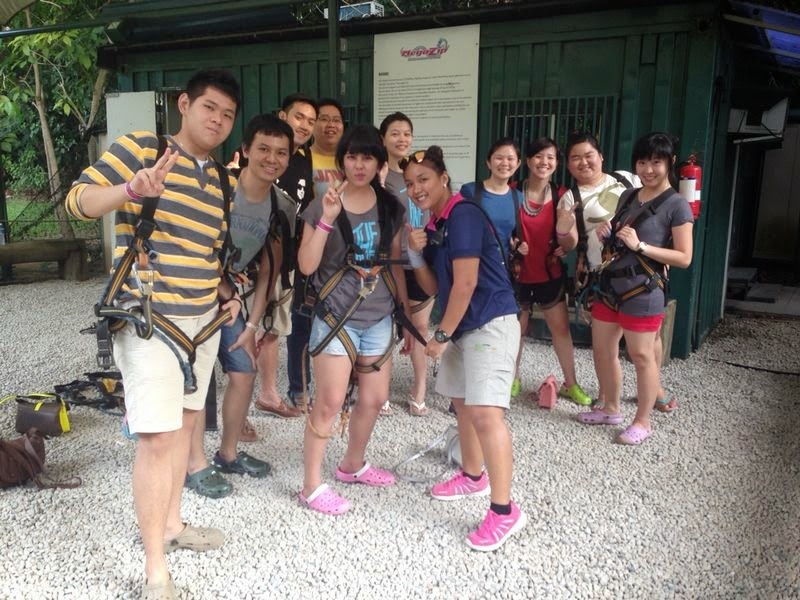 haha..
and i think those skydive and bungee jump is a new whole level of raising up your adrenaline. haha..
so, please do share with me if you have did those crazy things before.. i would love to hear your magnificent stories.. hehe..